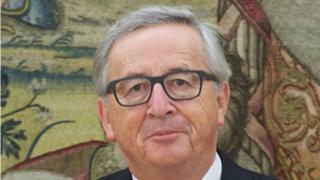 Jean-Claude Juncker has come under attack for dismissing concerns that controversial art storage facilities may be enabling money laundering. MEPs have criticised the response of the European Commission president to allegations about "freeports" - tax-exempt warehouses for high-value goods close to ports and airports. They include one in Luxembourg which was authorised when Mr Juncker was prime minister of Luxembourg. A spokesman for Mr Juncker said he had "personally and tirelessly" pursued an agenda against money laundering and tax evasion. The owner of the Luxembourg Freeport, called Le Freeport, said it makes sure the tenants who rent its space conform to best practice in anti-money laundering controls. But MEPs on a special European Parliament committee on financial crime and tax evasion found freeports could enable money laundering because they circumvent the normal international rules on transparency. "We came away from our visit to Le Freeport with a lot of apprehension," Anamaria Gomes MEP told the BBC. "This is a way that could be easily used to store goods away from anybody's control, for putting them in the dark when it's more convenient, avoiding tax. "The controls were extremely perfunctory and we did not see any real attempt to establish who were the real owners of the goods." Freeports were originally designed as bonded warehouses to exempt goods in transit from import duties or sales taxes such as VAT. But they are now used to store high-value items such as paintings, precious stones, gold and antiquities for indefinite time periods. Ownership of the goods can also legally be traded, transferring large sums without any public disclosure of information about transactions. Paintings, gold and other artefacts can potentially be bought and sold within the freeports without physically leaving the warehouses, enabling their owners to bank large gains without notifying tax authorities. Information on price, buyer and seller is not publicly disclosable. The MEPs heard evidence that freeports were "being used for shady, illegal transactions" in a "system that can be used for illicit economic activity all the time". "The high level of monetary transactions, the unfamiliarity of enforcement agencies with values and the portable nature of art itself all contribute to making the art market a suitable vehicle for illegal activity," the committee's report found. The BBC's seen a letter from a member of the committee, German MEP Wolf Klinz, who wrote to the European Commission president in January warning of possible fraudulent activities at Le Freeport, Luxembourg. In a response cited by Mr Klinz, the Commission praised the advantages of freeports, as "useful to simplify commercial operations", adding there was "no evidence showing that free zones in the EU are systematically used to commit fraud". Mr Klinz criticised that response: "Even if they are not used systematically to do fraud they may occasionally do that. It is not satisfactory at all: I don't think he has taken seriously what we contacted him to tell him," Mr Klinz told the BBC. Concern about the lack of transparency at freeports was underlined in 2016, when Swiss investigators raided Geneva Freeport and confiscated a valuable painting, Seated Man with a Cane by the Italian artist Amedeo Modigliani, whose ownership was under dispute. Le Freeport was built in 2013, when Jean-Claude Juncker was prime minister of Luxembourg. Located near the duchy's Findel airport, its majority shareholder is Yves Bouvier. In a matter unrelated to Le Freeport, Mr Bouvier, who is also a prominent art dealer, is currently under investigation by the Swiss authorities on suspicion of tax evasion. He has strongly denied any wrongdoing. He said the shipping companies who rent space at Le Freeport are required to know the beneficial owners of their goods and to conduct anti-money laundering checks. "The Luxembourg freeport is the most controlled and transparent bonded warehouse in Europe, with 100% of the goods entering and exiting being checked and controlled by the customs and mandatory identification of all beneficiary owners. It is high time European politicians took actions to reinforce controls in the 16,000 other bonded warehouses in the EU, where little if no custom checks are taking place and no information about beneficiary owners," Mr Bouvier told the BBC. MEPs who visited Le Freeport described it as "a black hole". "What motivation do they have for putting these works of art in a bunker?" said one MEP, Evelyn Regner, after the visit. In a statement to the MEPs committee, Le Freeport said Luxembourg customs had three agents at its site, who were able to operate independently. It added it was subject to the same regulations as financial services companies. Speaking generally about freeports, a spokesman for Mr Juncker acknowledged they "can potentially pose risks of money laundering and tax evasion." But it said the Commission was addressing that with a review of freezones across the EU. "Since this Commission took office, we have made unprecedented strides to boost tax transparency and to close loopholes leading to large-scale tax avoidance at EU level. Steps that would have been unthinkable just a few short years ago without the political will and drive of President Juncker himself."